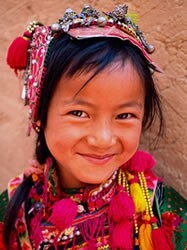 Overview: The Nosu are a Tibeto-Burman ethnic group of China. Though classified by the Chinese government as a subgroup of the Yi, their languages are not typically intelligible with other Yi languages and the Nosu identify themselves as a separate people from other Yi subgroups. Most Nosu live in the mountains of northern Yunnan and southwest Sichuan where they labor as farmers and practice ethnic religions.